After our trip to North Carolina last month, we drove up to Pennsylvania to visit with Larry's family. It turned out that our friends Brooke and Christina were also in town visiting family. 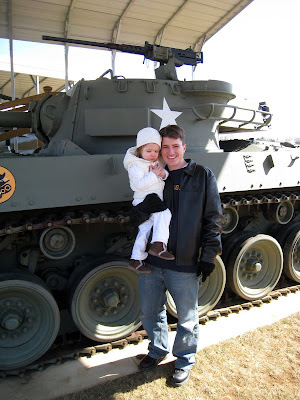 So we got together and visited the U.S. Army Heritage and Education Center in Carlisle. 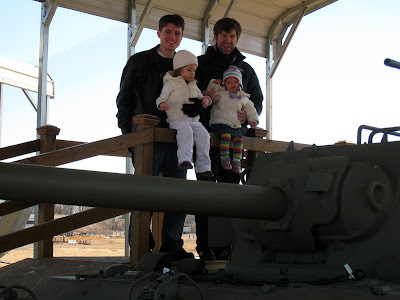 Here's Larry and Brooke with daughters Ava and Isobel. 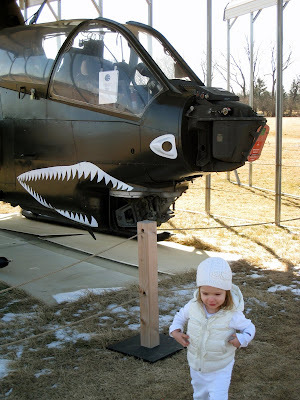 Ava wasn't as impressed by this war helicopter as we were. So we headed into the museum for warmth. Having concluded our tour of the museum (which had tons of great WWII memorabilia), we drove to downtown Carlisle for some lunch. 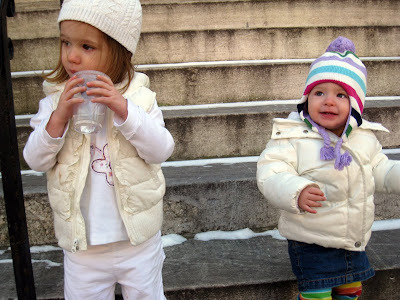 After lunch we stopped in front of the library to take some pictures of Ava and Isobel. 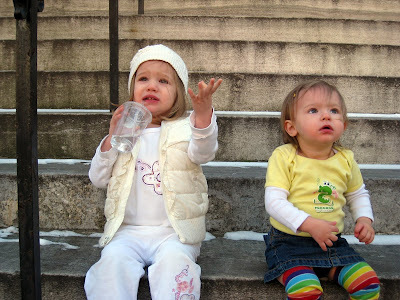 Ava decided to forecast rain, while Isobel pondered the clouds. Based on Ava's weather prognostication, Isobel decided to dress warmer, her eyes fixed on the sky waiting to see raindrops. 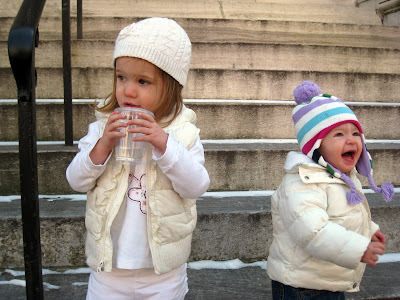 Alas, it did not rain and Isobel laughed at Ava's folly. All the while Ava sipped on her drink, cursing the rain gods for making her look like a fool. How fun that you guys got to hang out! Who would have ever thought that our KIDS would be playing together? They look like they had am awesome time! It's always good to see pictures of home. Thanks for sharing.